Hunting and Fishing are fun, they’re some of the most favourite pastimes of folks the world over. Fishing is actually addictive, and for a good reason; the day you make your first catch you’ll never look back again. But all the fun and excitement aside, things can become somewhat tricky when it comes to the right gear and fishing equipment. You’ll need to get the right gear in order to be successful in your endeavors and luckily Plano Tackle Boxes over a wide variety of options for all types of fishing. Plano offers a variety of Fishing Tackle Boxes and stowaways you’ll need to shuffle your equipment around. Knowing about rods, reels, tools and tackles is one thing; but it takes an experienced angler to know how to arrange their gear conveniently and neatly each time they’re on the move or on-site fishing. All your fishing gear is collectively referred to as tackle. Similarly, you’ll need to ensure that your gear is secure and are all safely stored when you’re out there in the bushes. When it comes to the world of fishing and hunting boxes/bags/cases/stowaways there’s one brand that has distinguished itself for blending practicality, innovation, and stylishness in their items. Plano fishing tackle boxes and waterproof cases are some of the most common in the market today. How would you safely and conveniently carry your rod, hook, liner, floater, reel, bait, spear, gaffs, nets, waders and so much more without the right stowaways? Your hunting rifles and other gear also need to be safe and secured in a casing at all times. As we mentioned, Plano is a major brand in the world of fishing tackle boxes and stowaways, who pride themselves ofnmaking fishing storage boxes from as early as 1952. ✔ Fishing can be done from anywhere including ocean and beaches, inland (rivers, lakes, dams, creeks, ponds). Regardless of where you’re fishing from, you’ll need a good tackle box that accommodates all your gear, is easy to carry around, has a water resistant casing, and so on. ✔ Plano stowaway boxes for fishing are durable, light, and available in a range of sizes and designs. For instance, some have spacious compartments and dividers where you can meticulously arrange each and every item. Others like the Flipsider Three-Tray Tackle Box have a specially designed bulk storage area. ✔ Basically, your size of gear and personal preferences are what will guide you in picking the ideal Plano tackle box for your angling needs. Clearly, if you’re an infrequent angler who is okay with catching a few fish, you’ll be ok with a small or medium stowaway; but professionals who go fishing for hours may need something bigger to accommodate multiple bait jars, hooks, and the likes. ✔ There’s a huge variety of fishing hooks, in terms of the sizes, shapes, and designs. The hooks should always be stored safely not just to prevent accidents, but to also maintain their sharpness and keep them rust free. Plano tackle boxes are designed with practicality and innovation; the hooks are safe and well encased inside their compartments, you can pick them up easily without risk of injuries. ✔ When talking about sizing and dimensions, Plano tackle boxes come in the following sizes: 3400, 3500, 3600, 3700. Plano tackle bags are available in a variety of designs, colors, and shapes. Whether you’re looking for a practical, stylish bag to perfectly fit your fishing rod, or one to carry your personal items when you’re out fishing on a kayak or canoe; Plano has it all. One of the most popular tackle bags in the market today is the Plano A series bags; these classic storage bags have a rugged, outdoor look and are available as a backpack. Most have a waterproof base and sturdy handles; you can also use the shoulder strap to carry them around. Plano fishing backpacks are another testimony to Plano’s reputation as a leader of outdoor storage solutions. Big, bulky bags can be a burden when out fishing; Plano e series fishing backpacks are stylish and fashionable. You can easily blend in with students, hikers, or commuters and still find the bags very ideal when fishing. You’ll also be pleased to note that the backpacks are resistant to abrasions and scrapes, plus they have side mesh pockets where you can store your water bottle. Plano has also added adjustable dividers to separate your contents; you have a pouch for placing your sunglasses, fishing gear, refreshments, and much more. when it comes to fly fishing, it’s important that you keep your fishing flies (big and small) within reach, without mixing them up. 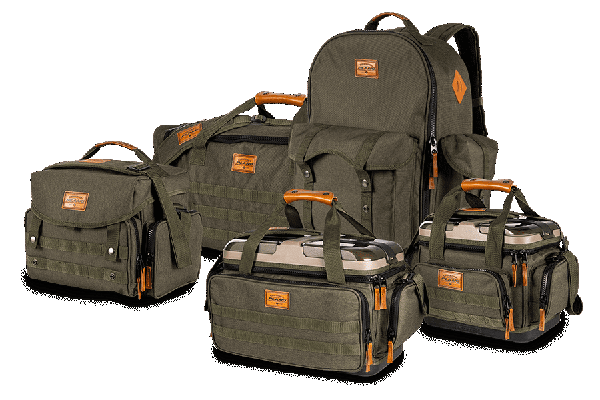 Plano tackle boxes for fly fishing are light, with a padded interior (most Plano products have a high quality foam used as the interior padding). The bags are light but sturdy; carry all your fishing gear with comfort and ease. Plano A series 2.0 Tackle bag is a definite head turner, it has all features that an angler on the move would require; a cushioned back, exterior pockets (with zips and snap buttons). 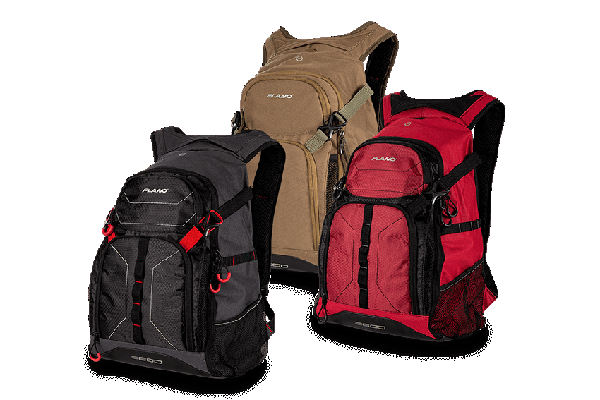 The A series of Plano bags are available as a duffel, backpack, or a tackle bag. The bags are also comfy, you’re able to free your hands and concentrate on fishing with the bag resting comfortably on your back. A good stowaway for fishing gear offers more than just storage space; you also get convenience because all your gear is safe and secure. Plano stowaway boxes for fishing are also available in a variety of sizes, shapes, and designs. Some have multiple compartments to enable you store bulky content. Needless to say, these stowaways have a waterproof base; others can be submerged in water and still remain airtight. Does color really matter when choosing your tackle box? Yes it does! Plano bright tackle boxes are available in different bright colors, and for a good reason. Bright green, orange, red, blue; these are some of the most common colors you’ll find with most Plano tackle boxes. Bright colors are easier to spot from a distance; the same reason why airplane Black boxes are red or bright orange. are you a big game angler? Looking for ample storage space for multiple baits? Some Plano big game tackle boxes can hold over 40 baits, with a removable racking system. The brass latches are as durable as they are comfy to your hands. Get one of these big game tackle boxes and see how easy it’ll be to organize big game baits. there’s no better way to introduce your kid to fishing than getting them a Plano let’s fish satchel. It’s a nice way to have the little ones get organized; the satchels come complete with plastic worms and hooks. You can pick any color from purple, blue, green, and red. Like with most Plano products, these satchels are durable and can be used for years without any signs or tear and wear. The satchels are light and the handles are made to perfectly fit in the hands of the little ones. when you’re out there fishing, you need to ensure that your valuables and personal items are all safe and secure. Thanks to this Plano Guides Series Waterproof Case, you can safely store your phone, wallet, car keys, camera, and other electronics. There’s actually sufficient storage space for larger items and the box is airtight, it can be submerged in water for 30 minutes without leaking in. It’s durable, it’s light and has comfy latches for holding when you’re on the move. Elite series Large Crankbait Stowawaystoring your lures safely is very important; it prevents you from making a mess all over of your Crankbaits. The Elite Series Large Crankbait Stowaway is 14 inches long and 9 inches wide, made of a transparent material; according to the manufacturer, this makes it easier to identify the contents therein. Additionally, this utility box is known for its unique V Groove tray that helps keep fishing hooks safely tucked away. The groove is patented and only found in this Plano unit. It’s large enough to accommodate up to 20 Crankbaits. Are you an avid angler who’s constantly wading or walking in water? Looking to keep your live baits alive and secure? This Plano ProLatch Bait Container Stowaway will come in handy; you can comfortably carry 18 bait jars. Each jar is held securely in an upright position, plus the ProLatch closures are extremely secure. Whether you fish on your canoe or kayak, or even by standing on the shores; you’re always assured that this transparent Plano stowaway is water proof and you don’t have to worry about spills and leakages. Plano ProLatch Six Compartment StowawayThis is your ideal kind of stowaway if you’re looking for a medium box to store and carry your baiters. With 6 compartments and secure latch closures, this Plano tackle box is very recommendable for newbies and occasional anglers. The simplistic design and clear compartments come in very handy when you want to quickly pick a live bait without fumbling around. The box is also light and very convenient to carry around. Plano Stowaway Four Deep Open CompartmentPlano tackle systems are renowned for their stylish and innovative designs and when it comes to this unit, it doesn’t disappoint. It has a stylish, modern design and separate latching systems to ensure that the compartments are secure and tight. There are 4 compartments, each 9 inches deep; your tackle and baits are all held safely and securely. Actually, this is one of the few Plano tackle boxes that is spacious enough to accommodate not just your fishing gear, but accessories like your gloves, knife, glasses, and so on. Plano ProLatch Stowaway DeepThis ‘beast’ can comfortably accommodate several pork jars as well as large baits. Its upright design helps hold each jar safely and in place. The interior is made of high density foam padding; identifying and picking your baits and other content is super easy thanks to the transparent compartments. The compartments can be 4 to 15 inches deep. This tackle box is ideal for big time anglers who require a large number of lure baits and different hooks, all safely secured inside their compartments. The ProLatch closures are very secure. The Plano umbrella rig stowaway 3700Like the name suggests, this specially designed rig box has patented pending dividers that enable you to safely store 4 multi arm rigs. The clear plastic used to make this stowaway is light and durable; store your 5 arm umbrella rigs securely without them crimping or bending. It’s super easy to store or retrieve your rigs especially when you have to quickly swap jig weights. When the current changes you need to quickly alternate the rig weights so as to stabilize your hook and reel; this 3700 stowaway will be your perfect partner during such moments. Plano Connectable Satchel StowawayThis Plano utility box is available in large and small units, with the large one offering 5-22 compartments. The lid is clear; you can easily see the contents of what’s inside. The handle is also smooth and comfortable to hold, this comes in handy when you have to connect the box to another satchel for more storage space. This is s true workhorse, your contents are still safe and securely held in case you drop the case to the ground or on water; the unique ProLatch locking system holds everything securely in their compartment. And did we mention that the compartments are adjustable? Plano Hybrid Stowaway Tackle Box 3700with Plano, they have every angler in mind when designing their tackle systems. This unit has 3 stowaway spaces that are very conveniently accessible through a front door that drops-down. It offers sufficient storage space even for bulky contents. The unit is available in blue color, with the latches being made of heavy duty brass. Plano have converged old style and new style in this stowaway; the design is extremely stylish, almost fancy. Plano Flipsider Three Tray Tackle Box; it’s durable, it has a stylish design, and comes with a lifetime warranty against any defects. We’re talking about the Plano 7603 Flipsider 3 tray tackle box. It offers ample storage space, thanks to three deep trays that can hold baits, jars, hooks, reels, fish grippers, and much more. Most anglers love this unit for the simple fact that the Flipside technology (which is actually patented) offers them top bait access. The Built in handle is also worth taking note of; it’s sturdy and comfy to your hand even when you have bulky gear with you. This unit is well balanced in terms of style and price, the hinges work perfectly and it’s still stable (no flipping over) when each tray is extended out. Since 1952, Plano has been innovating and exploring new concepts, ideas in making their tackle bags and boxes. Regardless of whether you’re a beginner who needs just a small utility box to store your tackle, a big time angler with a load of gear; Plano has something for everyone. The Australian Flathead, Barramundi, Black Bream, Mulloway; these are some of the most common fish here in Australia. However, catching any one will require different skills, different gear. If you’re going to catch Barramundi for instance, you’ll need to have multiple live bait rigs or use diving minnows. You’d thus need a Plano box that can hold multiple rigs like the Plano Umbrella Rig Stowaway 3700. If you’re looking to go Fly Fishing, you’ll get a tackle box that’s suited for just that. Do your research well and decide where you want to go angling, always feel Okay starting small. You don’t have to begin with the largest, most equipped Plano tackle box; like aforesaid, Plano has something for everyone including newbies. Plano boxes are available in different shapes and sizes. Their products include boxes that hunters, archers and anglers can always rely on for their storage needs. In fact, any experienced angler or hunter, archer will tell you that Plano is King when it comes to offering innovative, customizable storage options. For the last 60 years, Plano has been continually designing some great tackle boxes for fishers and hunters. This is where passion and practicality perfectly blend. Looking to get your first Plano Tackle Box? Or replacing an old one with a newer series? This is the best time for that, you’re likely to get a good deal this festive season as most brands offer nice discounts at this time of the year. Plano products come with warranty and are durable, practical, with an element of stylishness. You can never go wrong with Plano. As long as you’re shopping from certified dealers of Plano products, you’re always 100% certain that the product you’ll get it original and genuine, and that the warranty is valid in case something happens. Lastly, be safe when out angling! Always check your gear thoroughly before venturing out, inform a family member or friend that you’ll be heading out to fish; better still, pairing up with someone else is always safer and more fun. You may need special licenses to fish in some areas, so again, do your research well in this regard. kindly check out our next post on Plano bow cases if you’re a hunting enthusiast. Just that we figured out we didn’t want to mix up the two, especially considering that Plano has so many units and models of fishing tackle boxes you need to learn about. We will only send new product updates and never share your details!